Immersion participants will build and characterize a mode-locked erbium fiber laser. Basic laser physics (gain, loss, cavity dispersion) determines the performance and properties of the laser output. Two methods for passive mode-locking will be explored. The first uses the nonlinear properties of the cavity fiber, which affect polarization rotation, to favor high-intensity pulses. We will carefully align a polarizer and a series of waveplates in a free-space segment of the cavity (see figure below) to optimize conditions for pulses. The second mode-locking technique uses a short, tapered segment of intracavity fiber coated with carbon nanotubes to act as a fast saturable absorber. Output pulses from such a laser can be on the order of 100 fs and are strongly influenced by the cavity dispersion properties. The Fourier transform of a train of pulses is a relatively broad spectrum of individual frequencies separated by the cavity pulse repetition rate. When stabilized and broadened, this comb of frequencies acts like millions of stable lasers and can be used for applications such as frequency metrology. (The steps to make the mode-locked erbium fiber laser in this Immersion into a frequency comb will be the subject of a future Immersion.) Participants will build an auto-correlation device using the nonlinear response of a silicon photodetector at the lasing wavelength of 1.5 micrometers to characterize the temporal profile of output pulses. Mode-locked erbium fiber laser based on nonlinear polarization rotation. 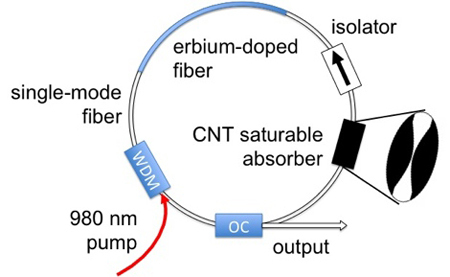 Mode-locked erbium fiber laser based on a carbon nanotube (CNT) saturable absorber. Mode-locked fiber lasers have emerged as a relatively low-cost, high performance tool. The list of ultrafast fiber laser applications is long and growing: frequency combs, pump-probe experiments, precision atomic and molecular spectroscopy, pulse shaping, astronomical measurements, precise length measurement, absolute frequency measurements, and microwave photonics. Fiber lasers have a small footprint (<1 m2) and use common telecommunications equipment such as high-power diode lasers that pump amplifiers and lasers. The carbon nanotube mode-locking design—possibly used here by Immersion participants—enables one to avoid more optically complicated free-space elements and more expensive polarization optics. These factors mean that ultrafast fiber lasers can be efficiently brought into the important educational domains of the undergraduate and graduate-level advanced laboratory. Ultrafast technology is becoming increasingly important and yet is often not introduced until advanced and specialized graduate courses. Mode-locked erbium fiber laser. At upper left are the free-space polarization optics. At lower right is the glowing erbium gain fiber segment. The pump laser diodes are just above the glowing gain fiber in the figure. Skills that will be acquired during this Immersion include fiber cleaving and splicing, optical alignment and design, simple electronics design, and familiarity with optical and RF spectrum analyzers. 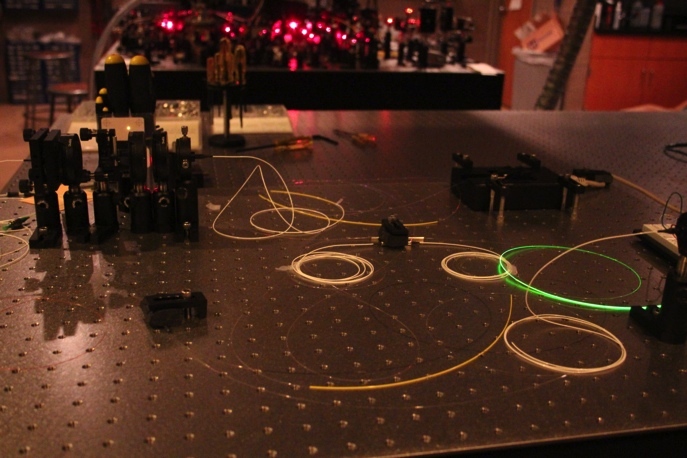 Participants will use an existing laser to measure the single-pass gain of the erbium-doped fiber, which will allow an estimate of laser parameters for the construction of another laser. Single-mode and gain fibers will be cleaved and spliced to pump diodes, an isolator and an output coupler to make a laser. Participants will measure the laser slope efficiency (Pout vs. pump diode current) in continuous wave operation. Free-space polarization optics will be inserted into the cavity and adjusted to observe mode-locking. Mode-locked pulses will be characterized using an oscilloscope, timer/counter, a power meter and a home-built auto-correlation device. The pulse spectrum before and after mode-locking will be recorded on an optical spectrum analyzer. If time allows, participants will substitute a length of carbon nanotube-coated tapered fiber into the laser cavity to induce modelocking, followed by full characterization of the laser output. A single mode-locked erbium fiber laser can be constructed for an estimated $5000. This includes fibers, carbon nanotube solution, telecom components such as output couplers and WDMs, pump diodes and drivers, detectors and optics. This price does not include an oscilloscope, timer/counter, spectrum analyzers, or a fiber fusion splicer. The latter can be purchased on eBay for less than $5000, or, instead, connectorized fibers could be used in laser construction.